0.80cts JSI2 Oval Diamond Solitaire. 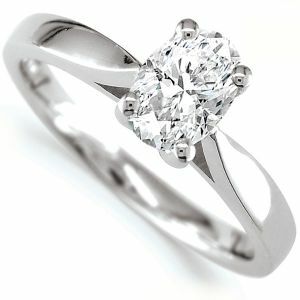 Four-Claw Diamond Solitaire engagement ring with open tapering shoulders and a court ring profile. a 0.80ct Oval cut Diamond sits nobly in the centre of this elegant ring design, and is held securely by a four claw setting on top of open shoulders. The Diamond has been AGI Certified, and has been graded J Colour and SI2 Clarity and measures 7.00 x 5.03 x 3.24mm. Available in 18ct White Gold, 18ct Yellow Gold and 950 Platinum in various finger sizes, your ring can be with you within 3 weeks from the date of purchase.